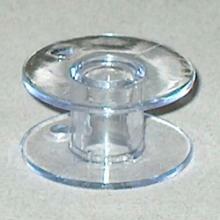 Singer presser feet and accessories are the answer to fun and professional sewing on your Singer sewing machine. There is an ever growing assortment of Singer accessories, each one is designed to simplify certain sewing tasks and most presser feet can be used for multiple purposes, further expanding their value. 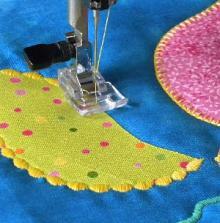 There are Singer attachments that will help every type of sewer, whether you are a fashion sewer, home decorator, avid quilter, or maybe you like to do it all! 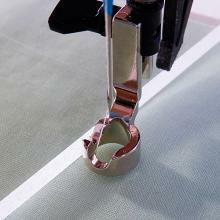 Singer presser feet and accessories are here to make sewing more fun. 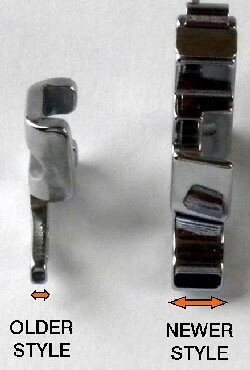 The snap on presser feet in this category are for use with the newer style wide snap on low shank shown on the right. You will need to purchase this new wider low snap on shank in order to use these snap on feet on older low shank machines that use the narrow snap on low shank shown on the left. 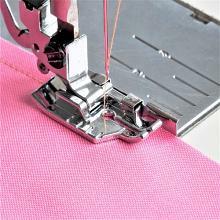 Slant shank Singer sewing machines require the slant shank snap on feet and slant shank screw on foot options when avaialble. 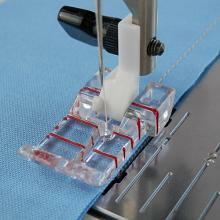 Singer model S18 is built by Janome and uses Janome accessories. Singer model S16 is made by Juki and uses high speed machine accessories. The presser feet in this category DO NOT fit the following Quantum models: DSX II, CXL, LE, XL-1, XL-150, XL-100, XL-1000, XL-5000, XL-6000.